Stingless bees usually have one, singly-mated queen. This can lead to a genetic conflict of interest between the queen and the non-laying workers over who should produce the males. In many stingless bee species workers have developed ovaries and can produce male-destined eggs. 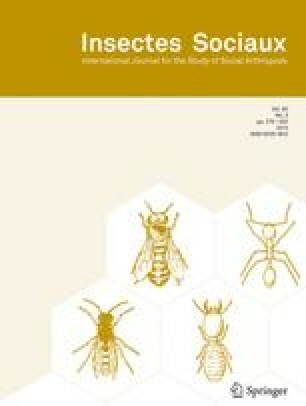 In this study we compile the available data on who produces the males in stingless bees. Worker reproduction is common but less frequent than expected from predictions built on relatedness-based preferences of non-laying workers. We tested whether the pattern in worker reproduction can be explained best by queen control, by an arms race between workers and their queen, by the costs of losing workers to reproductive competition, or by phylogenetic constraints. The data are consistent with the view that there is ongoing conflict over male production that is resolved differently depending on the specific dynamics of costs and benefits of worker reproduction. There was also a role for phylogeny; Melipona workers often reproduced while Plebeia and Australian stingless bee workers seldom or never did. The high worker reproduction in Melipona may reflect low costs, because many of the replaced queen-laid eggs would become excess queens. Received 17 April 2003; revised 2 September 2003; accepted 5 September 2003.